At approximately 4.15pm today [Dec.4] a Virgin Atlantic Airways plane landed at Bermuda’s LF Wade International airport, after diverting due to a sick passenger. The Virgin Atlantic VS069 flight was on its way from London’s Heathrow Airport to Kingston, Jamaica. 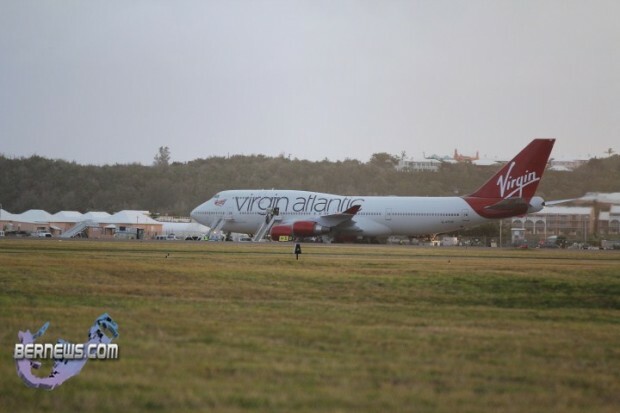 The plane was approximately two hours and twenty minutes out of Bermuda when it diverted. 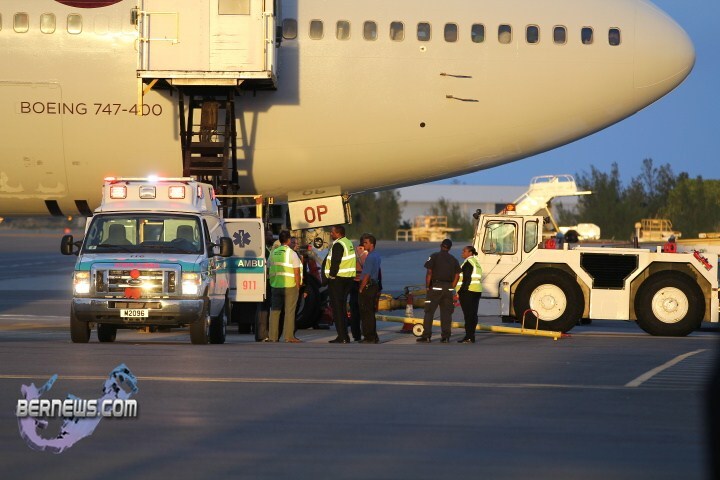 A female passenger was taken off the plane and transferred to an awaiting ambulance, and transported to King Edward Memorial Hospital for treatment. The woman’s young son, who was travelling with her, accompanied her in the ambulance. The plane took on some fuel and continued on its flight to Jamaica at approximately 6:30pm. Why not Bermuda? Seriously? Cus at this time of the year Bermuda’s weather is less than enticing and unfortunately winter here is pretty dull with very little to do in the evenings and almost zero entertainment. That’s why again this xmas i’m off to the Caribbean. Interenstingly, further research has found that whether it is by plane or cruise there is no decline in sight for tourism in the Caribbean. Even hurricanes and a series of recessions in the Western world appear only to cause temporary blips on Caribbean tourism’s ever-rising growth rate. However, despite tourism being a huge contributor to the economies of all Caribbean countries (the biggest contributors Antigua, Bahamas and the Virgin Islands), tourism actually contributes less to the long-term economy than expected. Much of the profit from tourism leaves the region with a lot of the profit going to foreign investment and foreign control of the Caribbean’s tourism industry (tour companies and two-thirds of the hotel rooms in the region are foreign owned). Unfortunately, Bermuda is too over priced for the normal vacationer. I often travel to The Bahamas almost every month and they are oozing with tourists. Perhaps the idea of having casinos here on the island should be re visited. Saw the approach, it was beautiful. Would love to see scheduled/regular 747/A340 and/or even the magnificent A380 landing at LF Wade Int. Once upon a time, a long long time ago, wide bodied aircraft were landing in Bermuda everyday. There were Pan Am 747s, British Airways 747s, Delta L1011s & Eastern DC10s. Big planes were a very common sight. We saw it as well. Just in awe at such a beauty. We prayed for the person to be okay. Congrats to all personnel with swift response to the aircraft. Bermuda tourism, please get this airline serving Bermuda- actually that’s like asking for you to get RCCL to bring the Oasis and Allure here- we’ll see (if we could get past the debaters). When we vacationed on it, all the Islands’ staff and residents were bragging having it at their port. When Bermuda is practically empty in the winter, those Islands are rammed with tourist, and booming with business. All we could say was, ‘so this is where everyone is, other than Disney’. But, well done Bermuda airport and all ER team members, you made us proudwatching you in action. I’m with you nobody is talking about how is the lady feel. But the big plane. SMH. This is a lesson to all .. Buy travel insurance at all times . Landing in Bermuda for medical reasons is a very expensive ordeal . i always thought our airport was too small for big planes like that. wish i saw it land..hope the lady is ok.
… you’re kidding me, right? You should know that Bermuda’s strip us one of the largest/longest in the world. Yea, the Airport may be tiny, but our runway is close to 10,000ft long and this is after it was shortened a bit. That length can land practically anything. I believe it was one of the alternate places for the space shuttle back in our NASA days due to the length as well. If it can safely land an unpowered space shuttle with nothing but spoilers and parachutes to slow it down, it can safely land all other aircraft regardless of size. Plus, the boeing 777 is one of the largest passenger jets out there, only smaller than 747 and A380 I believe. I might be wrong. And BA flies that here all the time, so a 747 is nothing. I do hope that the lady is recoverig well and that her young son is being well taken care of until they can depart. 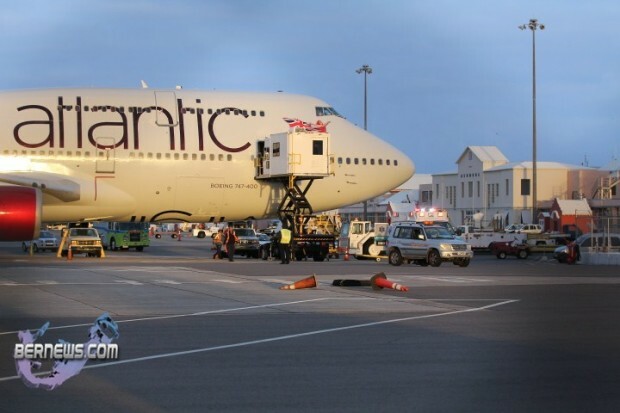 That said, it wou;ld be nice if we could have more than one airline flying to UK, sometimes going to Gatwick does not cut it and if Virgin can fly from Heathrow to Jamaica, I see no reason why it can’t do the same from there to Bermuda, but then again I have no clue how airport operations work here in Bermuda.